A: This year's weekend wasn't the worst we've seen in terms of number of thefts, though it was slightly above the average weekend. During holiday weekends, it's important for shippers, carriers, and brokers to make sure shipments are secured and to educate drivers on cargo theft tactics and prevention methods. It would be ideal to avoid leaving loads unattended. However, when that's not an option, we recommend a layered approach to protecting shipments. This includes good processes and procedures, staff and driver education, and physical and technological security enhancements. Q: Five or six years ago, most thefts were yard heists and inside jobs conceived by ex- or current employees in the distribution center. Given the abundance of digital tools and thieves' mastery of them, is the traditional scenario still commonplace? A: What we call "straight" theft is the most common type of theft, and it happens most often at unsecured locations. However, evolving technology has contributed to a rise in strategic theft, such as identity theft and fictitious pickups, by helping thieves identify their targets and find new ways to trick people. It's important not only to use physical security to protect loads, but also to have strong practices in place for protecting critical information and defending your company from cyber-based threats. Having this type of protection in place for virtual threats is just as critical as the physical protection needed around a yard or for a load in transit. A: Strategic theft methods have changed over the years. There was a time when we primarily saw two tactics—identity theft and fictitious pickups—but in recent years, we have seen more than a dozen different methods used. These types of cargo theft involve the use of fraud and deceptive information intended to trick shippers, brokers, and carriers into giving the load to the bad guys instead of the legitimate carrier. Organized cargo groups now use strategic methods such as double-brokering scams and "ghost trucks," and they will even trick legitimate trucking companies into picking up the loads for them. Additionally, thieves will combine two or three methods to further complicate things. Victims may not be able to tell how they've actually been hit. It is important to thoroughly vet all carriers and brokers through the Federal Motor Carrier Safety Administration (FMCSA), Internet search engines, third-party vetting companies, and industry associations. Work closely with shippers to confirm driver identification at the point of pickup, and don't hesitate to contact your customers and business partners if there is any question or concern. Often, the additional scrutiny will deter thieves from pursuing the load in question. A: It depends on whom you are talking about. Some larger brokers have dedicated teams with very detailed vetting procedures and security teams that can respond if they have a theft. Others may not have the same awareness or necessary procedures in place or dedicated resources needed to respond because they haven't yet experienced a theft. Q: It's been said that freight posted on spot market loadboards becomes a target as soon as it is visible. Loadboards are getting more traffic today as spot market demand remains very strong. What are the security holes in loadboard freight and how can they be fixed? A: Loadboards are as much a victim as the shippers and carriers in this situation. They are being taken advantage of while trying to provide a valuable resource and service, and there's only so much that can be done to stop it. Some boards restrict membership, but even that can be worked around, and when bad guys do get through, it's simple for them to profile a load to target. In this situation, it's important for users to exercise caution when coordinating through these boards. There are some steps they can take to help keep a shipment safe: First, establish strong pickup security policies and procedures. For example, require the driver to have a specific and secure pickup number to gain access to the load. Second, ensure everyone involved in the haul is who they say they are. This also goes for the freight broker assigned to choose the carrier. Third, check if your insurer offers the right coverages for these perils and has the resources to prevent theft issues and recover goods if the worst happens. Q: You said at a recent conference that thieves will "go to the well until the well goes dry." Does that mean they will leverage the same scenario until they are stopped? How do shippers and carriers combat this? A: Thieves know what they're doing. If they know they can target a specific company with good cargo and insufficient preventive measures, they'll do so until someone stops them. But they're also smart enough to move on when law enforcement or the targeted company starts cracking down. We've seen several shifts over the years where law enforcement will be on the lookout for one type of theft, and in response, thieves will shift their tactics to evade detection. Similarly, we've seen thieves make sudden geographic shifts when they realize they've attracted too much attention in one area. For example, we've seen California-based crews move to Arizona, Utah, or Washington to evade detection. This creates a Whack-a-Mole effect. A: Cargo theft doesn't take only one form, and neither should theft prevention. I can't stress enough the importance of taking a layered approach to protecting loads. Remember, processes and procedures are free, and they are often the best methods to prevent theft. Feedback: What did you think of this article? We'd like to hear from you. DC VELOCITY is committed to accuracy and clarity in the delivery of important and useful logistics and supply chain news and information. 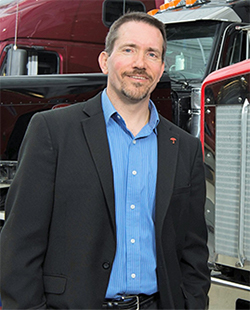 If you find anything in DC VELOCITY you feel is inaccurate or warrants further explanation, please ?Subject=Feedback - : The changing face of cargo theft: interview with Scott Cornell">contact Chief Editor David Maloney. All comments are eligible for publication in the letters section of DC VELOCITY magazine. Please include you name and the name of the company or organization your work for.